Indermica’s exclusive approach to creating their formulas resulted in products that take into account unique needs and skin types. The high-performance products deliver lasting results. Eighteen years ago SkinStore.com had the bright idea to take hard-to-find clinical skin care products out of the offices of dermatologists and make them available online—and often at better prices. Today, with over 250 brands and 7,500 products, SkinStore is considered by many to be one of the world’s leading specialty skin care product retailers. They have recently expanded their assortment of premium products to include Indermica clinical skin care. Indermica’s mission is to provide skin-rebuilding formulas that accommodate all skin types and unique skin care needs. Their research and development team is constantly on the hunt for new ingredients and compounds that can be used to revitalize the skin. Natural ingredients blended with proprietary compounds bridge the gap between science and nature. A unique process of layering molecules resulted in formulations that help to correct and protect damaged and aging skin. 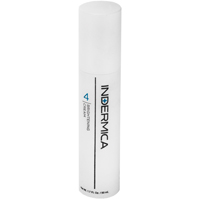 Indermica Brightening Cream is a non-hydroquinone skin brightener and corrector. Instead of relying on the controversial ingredient, the formulation works to help suppress hormonal pigmentation, regulating and diminishing the appearance of dark spots and uneven skin tone. It also works to lighten and brighten dull and aging skin. Physician-founded in 1997, SkinStore carries over 250 premium brands of skin care, cosmetics, hair care, beauty tools and fragrances from around the world, including high quality products normally found in luxury spas, fine department stores and dermatologist offices. An esthetician-staffed call center is available Monday through Friday to answer customer questions and help shoppers choose products best-suited for their skin type. The company is headquartered in Gold River (Sacramento), California. For more information visit SkinStore.com, SkincareStore.com.au or SkinStoreChina.com.